Looking at my backlog of nail photos, which isn't too big right now since I used so many while I was doing those treatment-only weeks, I think I might get to my vacation nail news by the end of this week, so stay tuned! I hope you had a great trip and congrats on your milestone! Congrats on your anniversary.. Thanks for sharing your wedding pic :) Hope you guys had a BLAST!!! Congrats!! That is so wonderful that you were able to do that! The wedding photo is great, you look beautiful, and you still do! Congratulations on your anniversary! You look amazing in your wedding pic! Usually 80s pics look dated, but you look stunning! OMG Congrats!You were beautiful on this wedding photo! Love the dress! I wasn't even born. :))) So cool! Happy anniversary, Karen :) It's awesome that you two could take a trip back, lots of memories huh? How awesome! Happy anniversary and congratulations! congrats on 25 years together :) Great photos! I was graduating high school in 1986!! you look so pretty in your gown!!! Seriously-congrats on 25 yrs together-that is amazing and special and awesome-few people make it that long these days!!! Glad to have you back! That is the most gorgeous picture! You look absolutely radiant. Love all the lights in the second picture, too. So pretty. Congrats on your anniversary! Congrats on your anniversary!!! Your dress was stunning and so did you, but the thing I like the most is your super happy smile! BTW I was 11yrs old in 1986 :) and in 2005 I spent my honeymoon in California (and other beautiful places in U.S.), too! Congratulations!!! I was one year old and you were getting married! Amazing! You look so pretty ^__^ I expect to hear more now!!!! Congrats on 25! That's quite a milestone! What a gorgeous pic. I missed your posts btw! congratulations!!! I'm not even that sentimental, usually, but I always think wedding photos are gorgeous :) Thanks for sharing! That dress is stunning and you looked so beautiful wearing it! congrats on your anniversary!! You look completely GORGEOUS in your wedding picture.. lovely! You, and your dress, are gorgeous. Congratulations! You looked GORGEOUS on your wedding day! And that dress is amazing... I hope you kept it !! Congratulations! Amazing pictures, both of them! You look very regal in your wedding photo, I like it. You, my love, are gorgeous! And that wedding dress is to die for! That Disneyland picture is amazing! 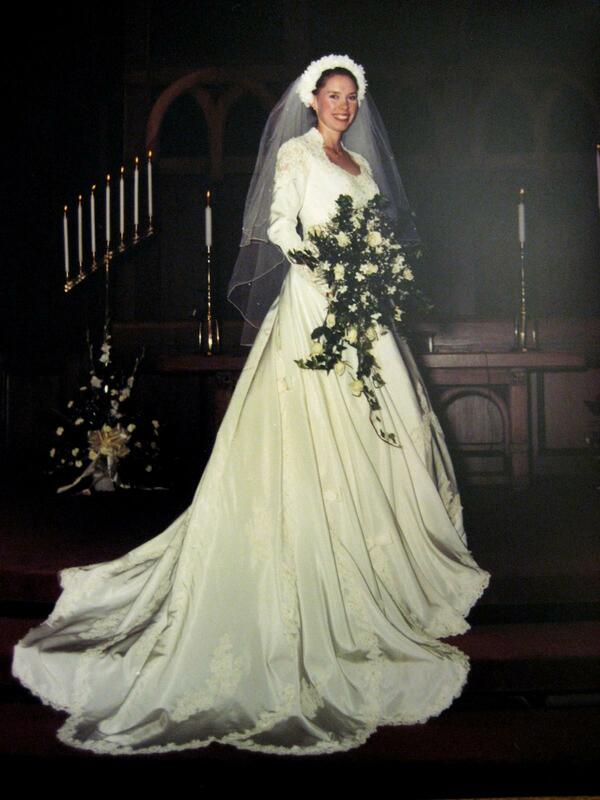 Congrats on your 25Th anniversary, your wedding dress was gorgeous! I was only about three weeks old when you got married. I can't wait to hear you nail news and I hope you had a wonderful time! you were a truly beautiful bride, karen. Thanks for all the congratulations and compliments, everyone! dameliac nails, I do remember my wedding day nail polish! It was L'Oreal Rose Delicat, a sheer pale pinky peach shimmer. I still have a half-full bottle of it in my stash.